To say Watain’s last album The Wild Hunt garnered contentious feedback would be underselling the vitriol that came from certain circles in metal. Between the nine minute balladesque “They Rode On” and vocalist Erik Danielsson employing melodic vocals on top of his piercing wail, it was clear the transformation they made on Lawless Darkness was not a limited affair. There was still a rampant display of putrid black metal present, but it was brushed aside by many who couldn’t see past the added instrumentation and unfocused songwriting. For their 20th anniversary, the group has reverted far back to their bloody roots on Trident Wolf Eclipse. This is what the band has been calling an album of “predatory instinct,” as if The Wild Hunt was the search before the catch. There’s no toying with the prey, no slinking in the shadows eyeing the right time to move in. The violence emitted through sonic waves is a response to any doubters that assumed Watain had lost the edge in their sound. Even those that have stuck with the band since the beginning may still be stunned by the directness of opener “Nuclear Alchemy.” Though they are from different genres, this has an all-consuming force behind it akin to Metallica’s “Hardwired” off their last album Hardwired…To Self-Destruct. Both songs signal the agenda of each band for what’s to come, though in Watain’s case, it’s to be minimal and destructive in momentary chunks. For a band used to albums going as long as an hour (and even longer, in the case of Lawless Darkness), they blaze through Trident Wolf Eclipse in 35 minutes. Downtime is a foreign concept, as any indication of a slowdown quickly dissipates. Even when the music settles away from the blast beat artillery on “Sacred Damnation” and “The Fire of Power,” it’s a prelude to the maddening tempos ahead. The brevity of the album, coupled with the focus into a rawer form of black metal, makes the songs on Trident Wolf Eclipse a bit hard to discern on first listen. Repeated ones, however, give each tune just enough of their own identity. The messy guitar solo on “Ultra (Pandemoniac)” works in the context of that song alone, just as the recognizable chorus on the aforementioned “The Fire of Power” fits that song’s ethos. There’s a seething anger that dominates Trident Wolf Eclipse. Wherever its inspiration came from, it’s the smartest move Watain could’ve made. There was little anticipation that this was what we were going to get out of them, but now that it’s here, it’s a great accompaniment to survive what could be a bitter winter for some of the world. 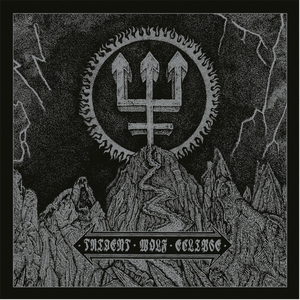 Trident Wolf Eclipse is for those who pined for Watain to put their energy into powerful, dissonant music with no compromises.